My favorite curtains of all time. They are beautiful & classic, but also are black out curtains so when you want the darkness, you get it. Would recommend anyone to get these for an elegant look. Aurora Home Mix & Match Blackout Tulle Lace Sheer Bronze Grommet 4 Panels bring a touch of glamour into your home with this decadent and dazzling curtain set. Showcasing a flattering gathered top on the tulle lace, these curtains provide an aura of mystique while blocking out excess light. For proper fullness, panels should measure 2-3 times the width of your window. Please note: There is a 1/2-inch allowance in length of panels. I have the vapor. I personally absolutely love my curtains. I honestly did not think they would look near as good as the pics.....and didn't have super high hopes.....however (and I think I'm a bit picky) I would recommend them over and over again. I live in a shared apartment and have my vapor curtains in my bedroom with a fairly large window and the curtains are just above the ground. The VAPOR is beautiful...not only my opinion, but my boyfriend's, family members, friends, literally anybody who has seen them asks about and compliments my curtains. 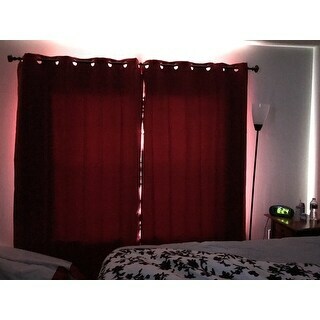 Sound silly......but my favorite part of my room decor are my vapor blackout curtains with the lace/tulle. The pictures are quite accurate in my opinion the VAPOR Color, in my opinion is (if I'm trying to describe color of the solid panels) i would say........Imagine pure white with the lightest hint of gray possible .......just enough to ever so slightly differentiate it from the pure white tulle/lace. Very, very SUBTLE. The VAPOR looks expensive, fancy, elegant, and I am absolutely obsessed with them. It is by far, my best purchase. I could NOT be any happier with my vapor choice! 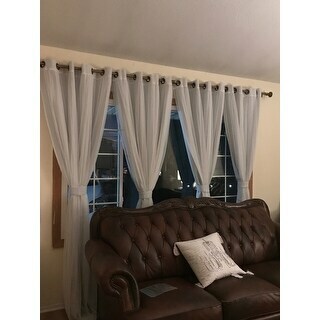 I have zero affiliation with this company or anybody except as a customer who has bought these exact VAPOR colored curtains several months ago and saw you question and I remember when I was ordering thinking and pondering on the true vapor co!or as well. I do not think you will be disappointed. I was elated when I put mine up. 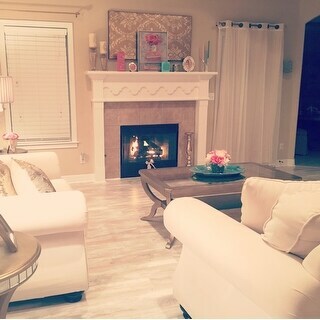 If I had a house i would then in the other rooms as well. As far as blackout is concerned, they do a very good job. The are soft, and decently thick. I live in southern cal and I don't think it keeps colder inside than the very dark sheet i had covering my window, and for blackout with these vapor-white curtains they do their job very well. 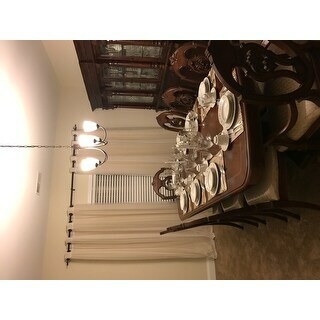 We purchased the rod that was recommended by overstock in a dark brown color! LOVE.... thank you so much. I've never gotten a purchase like this that was like way above what expected to receive. Overstock has yet to let me down in 2/3+ years of membership. After so many months, I finally found the one! 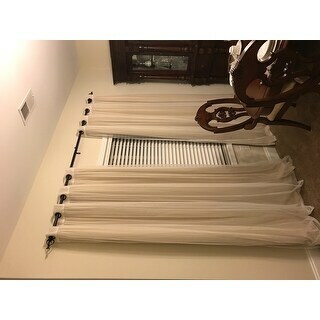 The Aurora Home Mix & Match Blackout Tulle Lace Bronze Grommet 4 Piece Curtain Panel Set gave me the privacy I need, with the sheer curtain on top to look nice. 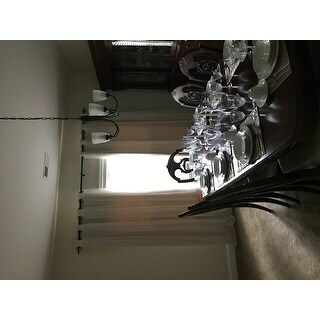 These curtains are so elegant my mom loves them too she will be buying some for her house too!! I love these curtains. The first set I received one of the grommets on the lace panel wasn’t attached correctly. I went ahead and hung the other panels and Overstock shipped out a replacement order for me to send back the damaged items. The curtains block out the majority of the light coming in. 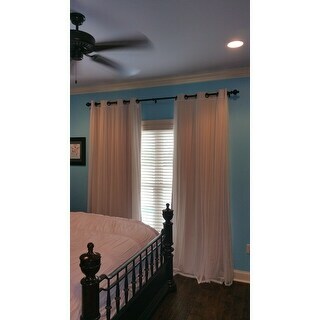 I have wrap around curtain rods and even with those the curtains won’t lay flush against the wall so light still comes in through the sides. I just push my ottoman against the wall to hold the curtains flat. The lace is a really nice touch. It’s more like a mesh netting not a lace that you would find on underwear or doilies. I will definitely be buying more. Typically with blackout curtains the materials are thick and are funky. The material is thick but it’s also flat so no funky sheens or 70s like materials. The lace netting also covers the blackout panels. 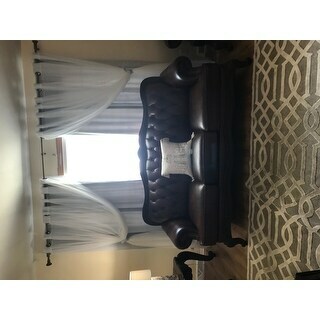 This would work great with dual curtain rods. The lace tend to stand a smidge higher than the blackout curtain. I think they are just a smidge bigger so it really covers the panel. These were easy to hang and easily able to remove wrinkles. Just toss in the dryer on low with a wet towel or use the steam function if you have one. The curtains block way more heat than I would’ve guessed. 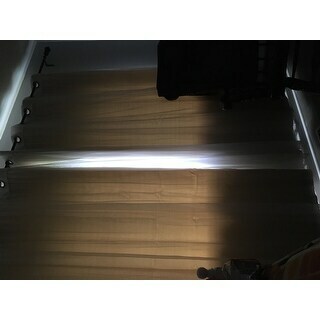 The other day I went to move the panel since my kids had opened them and my window was like touching the sun yet the curtain was cool to the touch. The heat the curtain was blocking was surprising. I am really happy and would eventually like to transition my whole home to these. I would anticipate these curtains could help lower energy costs from the heat and light they do blockout. And they look great! You should definitely buy these, the reviews speak for themselves. I made this purchase based on the reviews and I don’t regret it. 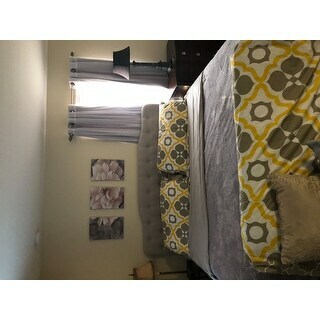 Curtain set is good quality and looks great in our nursery. The blackout feature work like a charm. They come in two pieces, but once they're hung you can't tell. The black out curtain is practical but the tulle adds elegance to an otherwise plain curtain. These curtains are wonderful! I purchased these in dark gray for my bedroom, and the color is great. The dark gray has a slight blue tint to it (e.g. not really a "pure" gray, but it definitely reads as gray) but it's perfect for my space. They are great quality and true blackout curtains, and all the different ways you can style these make these perfect for anyone, I think! The one thing I don't really care for is that the grommets are a kind of bronze. I'd prefer a silver/nickel color, but that's just personal preference. And the grommets don't take away from how much I love these. 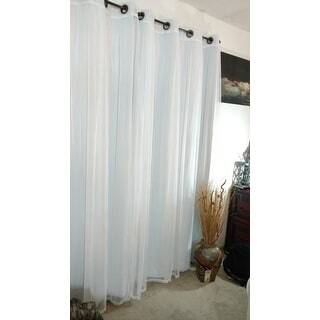 The blackout curtain is a high quality and thick curtain, and the sheer panel is tulle. 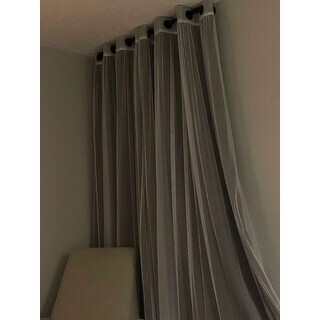 I definitely recommend these curtains!! This do not match the description. 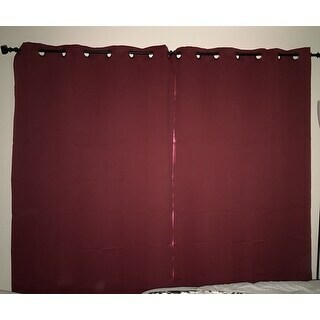 The color is more of a dirty red or maybe birgandy and they are not a black out curtains. I'll attach some pictures. Very nice to the touch, feels very soft. But I haven't even hung the sheer part and returned them, because I already saw that the color was wrong and they were not blocking the light the way I was hoping. I'll attach a couple of pictures (one with the light on in the room to show the color and the second one is without the light to show that they do not block the light). I have a magnificent view from my windows. These panels allow me to black out the room when I want and have a filtered view or a full view when I want. I like the variety of options for styling. Dressy but not too. 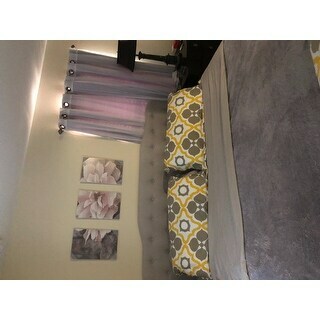 I ordered the beige curtains and they are perfect for my daughter's room. They do a wonderful job of blocking the light and keeping the room cooler. The beige behind the sheer overlay creates a creamy color which is a very close match to the trim color. The fabric is very nice and heavy. A great purchase! Love the length and the color of the Lilac! Blocks light well and looks great on a dual curtain rod. I got some in the Vapor color as well, which was too blue for my taste (I had thought they were more gray/silver) so I am going to try the Biscuit color in my living room instead. Much cheaper than other stores, but good quality! First and foremost, the color Beige is no where close to the pictures. It is totally dull and the white sheer curtains also look very tacky. 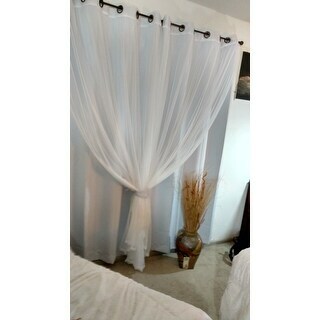 I decided not overlay sheer curtains on the beige instead I hung them separately. 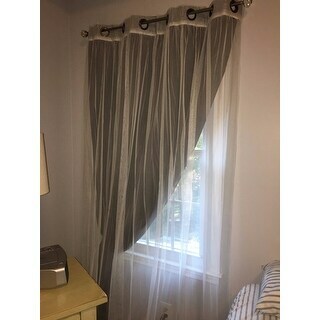 Curtain lengths are not even, curtain ends are shorter than the rest of the curtain, looks crooked. Overall very unhappy with the purchase. It took a long time for delivery, I'm not sure if I order a different color, what it might look like. I'd not recommend beige to anyone. Pictures are no where close to the physical product. Love them. They looks wonderful. The color is exactly like the picture. Very nice and thick material, it truly blocks light perfectly. I was worried at first with how much sun it would block but it was no problem. Also since the material is heavy the wrinkles come out after a day or two. The curtains are beautiful. I like that no sun can come in. It looks great in our bedroom. i luv these curtains. I looked for curtains for bedroom for long time and finally found something I like. They hang nicely and I like that you can change look by pulling back the sheer or just hang overlaying each other. My problem with this curtain was the color. I ordered it in "wheat" and the curtain I received looked nothing like the photo on the OS website (I checked three different monitors). The wheat shade is not a soft pretty creamy color, but rather is a very deep caramel color. It didn't work with the furniture in the room. With four windows to cover, this was too much money to blow off so I returned the curtains. Even though the color was misrepresented, OS still charged me for the return cost. I wish I had taken a picture of the curtains to show how awful they looked. "are you going to be able to get the Aurora Home Mix and Match blackout tulle lace Bronze Grommet 4 piece back. Cardinal Red?" If you’re looking for 63” curtains, we’re not planning to bring them back for the next 3 months. However, if you’re trying to purchase 96” curtains, we’re happy to tell you that they’ll be back in stock by end of February 8th. "If I order these curtains and the color does not match the color I’m looking for, may I return them?" "would I need two sets for an 8 ft wide window, would these look right with 4 panels"
I have an 8 foot window. I bought two sets, 4 panels and it's perfect and beautiful. Each panel is approximately 52 inches wide. One set of two panels would be enough to cover 96 inches. "Do you know when 96 inch length sky blue will be back in stock?" "Are these curtains all in one? Are they separate,needing two curtain rods? Are they truly black out? My husband works night shift, need dark dark room. How bad are do they wrinkle?" 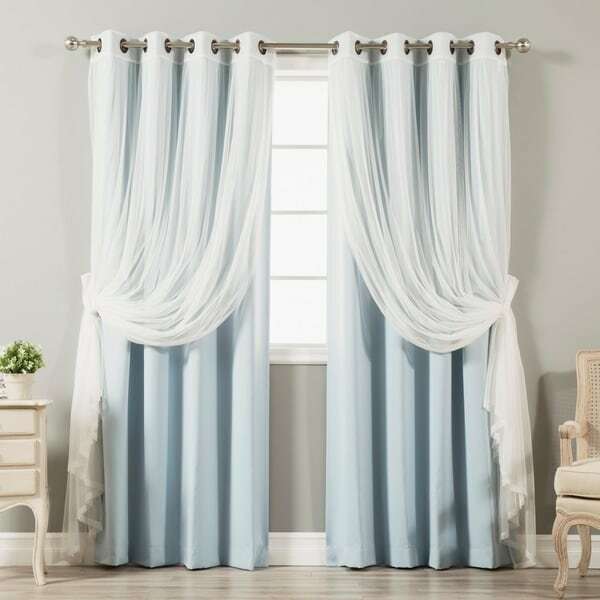 The curtins are not all in one; the sheer and curtain are separate pieces they they do not require two curtain rods and are designed to be hung together on one rod. They are room darkening but I'm not sure they are truly black out. In our experience, the curtains don't wrinkle and the packaging wrinkles came out after putting them in the dryer with a wet cloth on delicate cycle. They are beautiful and I highly recommend them! They're a great buy. 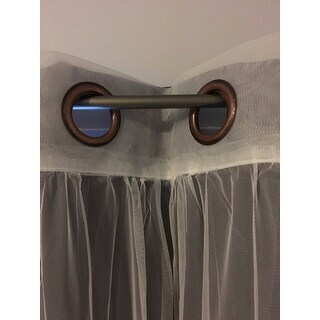 These curtains come as two separate pieces (sheer and drape) but they hang together on a single rod. The quality is very good, especially for the price. I bought the beige for a bedroom that gets a lot of direct sunlight from two different windows. They do substantially cut down on the heat coming through the windows in the summer, and although they dim the light they do not block the light entirely during the day. They are 2 separate layers. They do not need 2 separate rods, but you can if you want to. Yes they block out sunlight. We live in Queensland and the summer sun rises into the window at 4.30 in the morning. It is not pitch black but dark enough to sleep. I hope this helps. "Hi... Has anyone thought about putting a long curtain scarf across the the top...if so do you have a pic...Thanks"
"How do you get wrinkles out of curtains . Thanks"
I had to "steam iron" the curtains and after hanging the sheers I used a hand steamer. They turned out very smooth .... no wrinkles and they look fantastic!